Messier 75 (M75) is a globular cluster located in the southern constellation Sagittarius. The cluster has an apparent magnitude of 9.18 and lies at a distance of 67,500 light years from Earth. It has the designation NGC 6864 in the New General Catalogue. 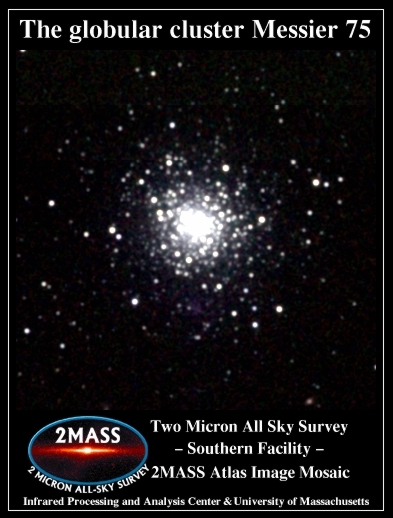 Messier 75 occupies an area of 6.8 arc minutes of apparent sky, which corresponds to a linear diameter of 134 light years. The cluster is located in the western part of Sagittarius constellation, right next to the border with Capricornus. 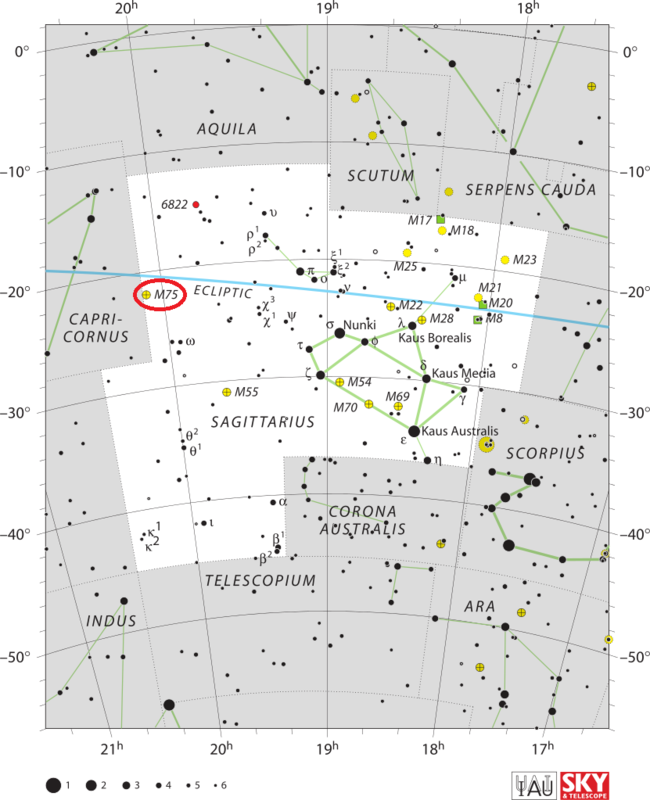 It can be found roughly 23 degrees from the centre of the Teapot asterism. The best time of year to observe M75 is during the summer. The distance of M75 makes it challenging to resolve the cluster with small telescopes. One needs a 10-inch or larger telescope to see the cluster’s stars. In binoculars, the cluster can barely be distinguished from the neighbouring stars, while 4-inch telescopes reveal a hazy patch of light. 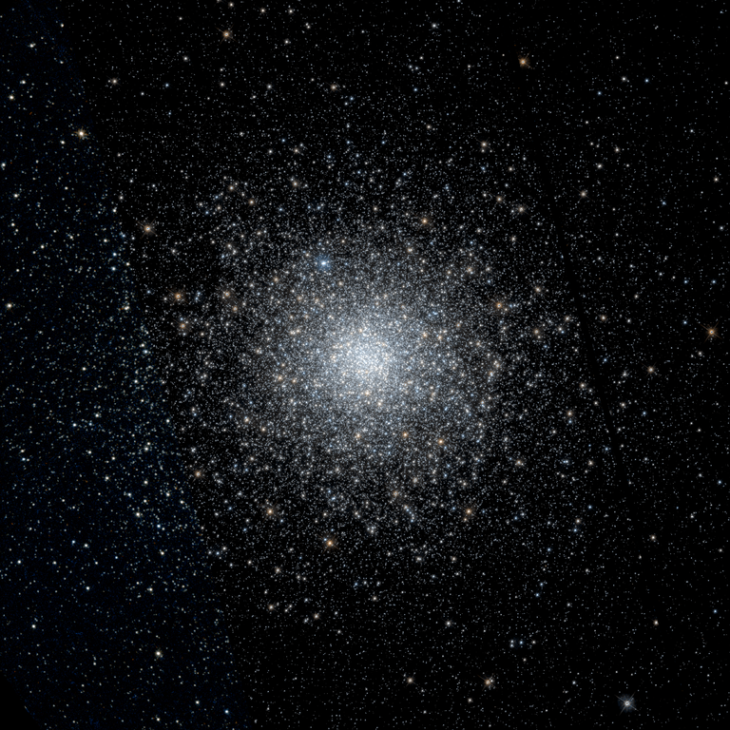 The cluster has the density classification I, which makes it one of the most densely concentrated globulars known and the single most centrally concentrated globular cluster listed in Messier’s catalogue. Located about 47,600 light years beyond the galactic centre, M75 is the second most distant Messier globular, closer to us only than Messier 54, which lies beyond our galaxy. The globular cluster Messier 75 Based on observations made with the NASA/ESA Hubble Space Telescope, and obtained from the Hubble Legacy Archive, which is a collaboration between the Space Telescope Science Institute (STScI/NASA), the Space Telescope European Coordinating Facility (ST-ECF/ESA) and the Canadian Astronomy Data Centre (CADC/NRC/CSA). 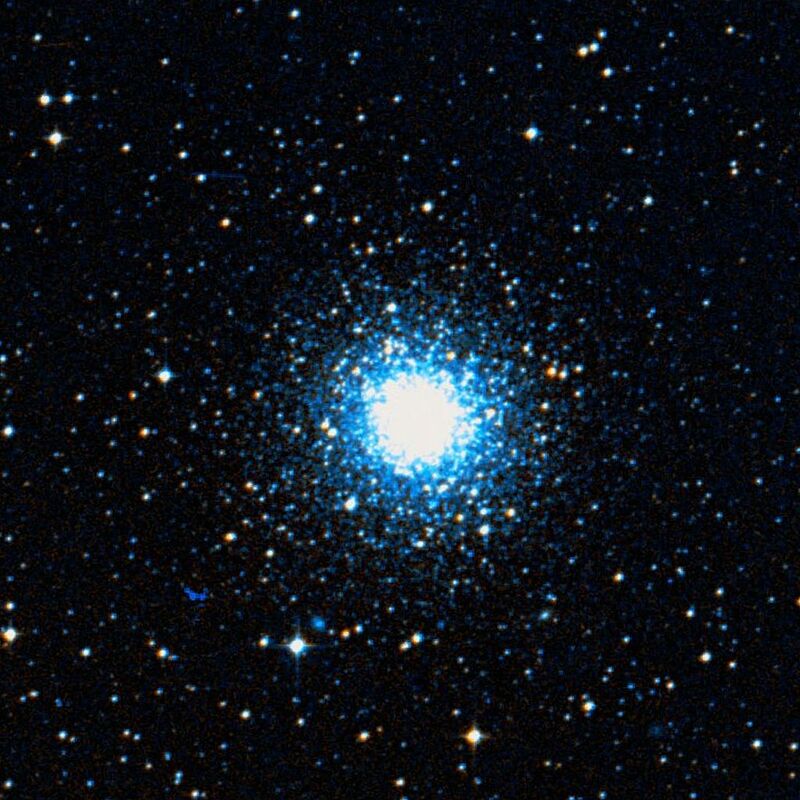 Messier 75 has an absolute magnitude of -8.5 and is about 180,000 times more luminous than the Sun. It is home to about 400,000 stars and believed to be about 13 billion years old. Nebula without star, between Sagittarius & the head of Capricorn; seen by M. Méchain on August 27 & 28, 1780. M. Messier looked for it on the following October 5, & on October 18, compared it with the star 4 Capricorni, of sixth magnitude, according to Flamsteed: it seemed to M. Messier to be composed of nothing but very small stars, containing nebulosity: M. Méchain reported it as a nebula without stars. M. Messier saw it on October 5; but the Moon being above the horizon, & it was not until the 18th of the same month that he was able to judge about its form & determine its position. William Herschel resolved the cluster into stars in 1784 and called it a “miniature of the third” (Messier 3). A globular cluster in the space between the left arm of Sagittarius and the head of Capricorn, and 7deg 1/2 degrees to the south-south-west of Beta Capricorni. It is a lucid white mass among some glimpse stars, with a large one in the nf [north following, NE] verge field. It was discovered by Pierre Mechain in 1780, who considered it as a nebula without stars; but Messier viewed it as a mass of very small stars, which opinion, on an object which at best is rather faint, was bold. In 1784, it was resolved by William Herschel’s 20-foot Newtonian, and, on being gauged, was assigned a profundity of the 734th order. No wonder that this miniature of 3 Messier (No. CCCCXCII ) should be pale to gaze. Messier 75. Atlas Image mosaic obtained as part of the Two Micron All Sky Survey (2MASS), a joint project of the University of Massachusetts and the Infrared Processing and Analysis Center/California Institute of Technology, funded by the National Aeronautics and Space Administration and the National Science Foundation.